Still behind on my posts…read my piece for Wired from last month in full below or by clicking on this link. It was one of the most popular posts of the day and I believe it was the first piece in the mainstream UK media that tried to sum up the position of drones in UK law. It was well received by the industry – being described as ‘comprehensive’. Since this was published there has been a test case. It is easy to be mesmerised by the footage of the floods shot by the drones, or unmanned aerial vehicles (UAV), of the major news organisations. The seductive close-up insight into the private grief of the many King Canutes is hard to turn away from. It is surprising that no disgruntled farmer has yet taken a shot at one of the UAVs. Yet these drones are flying into an area of the law that is confused and complex, and a debate about UAVs that has barely got started in the UK. It is a debate that is only going to increase in intensity as the numbers of drones licensed for commercial flights by the nation’s Civil Aviation Authority (CAA), which regulates the use of unmanned flying aircraft, shoots up — from 30 in January 2013 to more than 300 today — and as the popularity of DIY drones sold over the counter grows. In the USA, the Federal Aviation Administration’s (FAA) road map to the integration of drones by the self-imposed deadline of 2015 has caught the imagination of some Americans and had others reaching for their guns and the ballot box so they can have the right to shoot down these unmanned planes. According to the CAA’s spokesperson Richard Taylor, the number of complaints about drones in the UK is actually only in “double figures”. However, its limited resources already mean that it has to trust the drone operators to stay within the regulations, and then is left to try to identify those who don’t by looking at pictures sent in by the public and footage posted online. Taylor admits that “it is not easy to work out whether they are breaking the law from YouTube”. Neither has there yet been a test case in the UK to see whether laws relating to trespassing and harassment, designed to deal with peeping toms or broken greenhouses in suburbia, can really regulate this 21st-century technology or whether we need a comprehensive “Drone Law”. Sooner or later there will inevitably be a case when the privacy of a celebrity is invaded, a drone crashes and kills someone, or a householder takes the law into their own hands and shoots a drone down. In the USA the first ever test case to do with the regulation of domestic drones is currently going through the courts. It revolves around the sticky issue of what is commercial activity (and therefore much more heavily regulated) and what’s not: drone artist Raphael Pirker believes that his videos shot from drones are art; the FAA seems to disagree. For some academic lawyers, such as Alan McKenna from the University of Kent’s Law School, it may actually be the humble homeowner, using the existing laws regarding injury, trespass, privacy and nuisance, that ends up imposing order on the industry. “I saw footage taken from over one of the flooded areas; it must have been licensed by the CAA, but I would suspect it was in violation of the licence as it was very close to the flood waters so was not flying at the permissible height (50m from individual buildings or people and 150m from large events),” says McKenna. He adds that he doesn’t believe “the CAA is geared up to dealing with the wider use of drones”. How on earth can they police the widespread use of small machines, he asks. Even the hobbyist who wants to have a bit of fun can cause distress “in a variety of ways”. McKenna can’t see how the CAA could effectively police the use of drones with its limited resources “unless there was some way of requiring that each drone purchased includes some sort of monitoring device”. Some sort of GPS device would allow the authorities to keep track of drones’ movements and infringements. Until that happens, he believes it will come down to “ordinary people who are impacted by them having to seek their own legal remedies”. However, this approach will likely bring with it “all sorts of difficulties”, including gathering evidence and the cost of bringing actions. The relative lack of debate in the UK, he thinks, is down to “the much greater use of drones in the States”. Although that’s changing, with even the BBC launching a drone journalism unit. 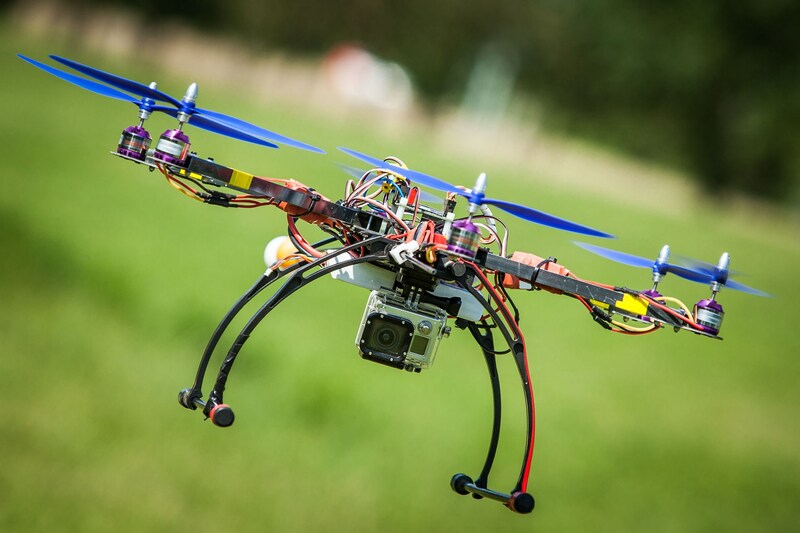 The CAA currently regulates unmanned aerial vehicles according to weight and/or purpose. Those drones that weigh more than 20kg are currently banned from flying in civilian airspace other than in a large zone in west Wales and a smaller one over the military base at Boscombe Down. Drones that are under 20kg can fly in normal airspace for private use so long as the operator isn’t planning to use data or images from the flight acquired by flying close to people or objects. UAVs have to remain 150m from congested events or large assemblies, 50m from a person or building, and within line of sight, which is 500m horizontally and 400ft (122m) vertically. Flights beyond this can be permitted but the operators need to show they can fly the plane safely. Live-streaming from the UAV to the pilot is not considered a good enough measure by the CAA to allow drones to be flown beyond line of sight. Anyone who is using a drone under 20kg for commercial purposes has to be licensed to ensure that they are sufficiently trained to fly the plane and have the appropriate insurance in place. Richard Taylor, though, balks at the word “licence” and instead prefers “permission”, as it is not really as “complicated as a licensing process and it’s just about making sure the paperwork is in place”. He also admits that thinking more about the potential explosion in number of drones under 20kg “is probably something that we need to”. There is a certainly a need to “remind operators of their responsibilities”, as being hit by a UAV “would kill you”. According to Taylor, the main applications to the CAA for permission to fly these small drones have so far have been for “photography”, which includes video, by news companies, the emergency services and power companies. At the moment the drones’ functions are limited by their size, since a camera is “about all they can carry”. Peter Lee is supportive of the approach that the CAA has taken in regulating unmanned aerial vehicles. Lee is a solicitor specialising in commercial and technology law with law firm Taylor Vinters LLP and one of Europe’s top drone lawyers. Despite this progress, Lee points out that the CAA is under pressure from industry to move as fast as possible in removing the regulations that prevent drones over 20kg from flying in civilian airspace. The military has much less money to spend on UAVs and these “defence cuts bite”, he says. The more non-military business that industry can generate, the better. Lee feels that, as with any new, potentially disruptive technology, the law touches drones in many different ways but “it is no more fragmented than, say, the law of the internet or mobiles”. This includes privacy, airspace regulation, negligence and intellectual property matters. “The huge number of applications of the technology — including in precision agriculture and offshore work — may mean it is not appropriate to have a blanket set of legislation,” he argues. One of the strengths of the CAA as a regulator is that it is comfortable reviewing drone operations on a case-by-case basis. However, he concedes that this may depend on “just how disruptive the technology actually turns out to be”. He believes that the CAA has “written a lot of good guidance”, and that the law will “continue to evolve in a piecemeal fashion”, becoming more sophisticated as the industry does. According to Lee, the CAA has investigated some worrying incidents but “to my knowledge nothing significant has yet made it to the courts”. He thinks it possible that the first cases to reach court will be around invasion of privacy, illegal use by saboteurs, or will be brought by civil liberties groups unhappy with how police are using drones. Unlike McKenna, he feels it is less likely to be the ordinary homeowners who in effect regulate the industry, because of the costs involved; these kinds of cases “tend to be settled before they get to court”. For Andrew Joint, technology partner at law firm Kemp Little, “the existing laws are robust”. They take a very common sense approach, and as a homeowner you have probably the same rights in dealing with a drone as with a nuisance neighbour. There is also criminal law. “If you are flying out of sight, trying to land in a neighbour’s garden, and if something goes wrong, you are probably being reckless and can be prosecuted under existing laws and you probably deserve it,” says Joint. The law might change, he thinks, if everyone suddenly gets a drone for Christmas: the legal system would be forced to respond to the trend. Lachlan Urquhart is a PhD candidate at Horizon DTC, School of Computer Science, University of Nottingham, and author of the research paper The Aerial Gaze: Regulating Domestic Drones in the UK. While the debate in the UK is much less developed than in the USA, he think this may be about to change. The European Commission working document on developing civil applications for drones has set out “a strategic Europe-wide vision” for civil UAVs, which has now led to the creation of Europe’s own road map for integration with various long- and short-term goals”, in contrast to the UK’s more pragmatic approach. “For example, I think that if drones are used for overt surveillance, in the same way that CCTV cameras are, then there might be regulatory controls via the new Surveillance Camera Commissioner.” The Surveillance Camera Commissioner’s role is to encourage compliance with the surveillance camera code of practice. According to Urquhart, that code is there to “ensure that individuals and wider communities have confidence that surveillance cameras are deployed to protect and support them, rather than spy on them”, but it is limited to “public” camera systems (government-owned), which might not catch all the private operators — and “ultimately it is just a code, not law”. “There could be tensions surrounding how mobility of drones alters the understanding of reasonable expectations to privacy in public spaces, given the operator can follow individuals around over longer distances,” he adds. Combine this with the democratisation of technology through the hobbyist movement, together with the possibility of protesters using drones against police, and there appears to be a clear need for law to be preemptively written, instead of applied in a piecemeal way. Of course, as Richard Taylor points out, the UAV industry is still in its infancy. Anyone who thinks a drone is being used illegally would be better of taking its picture rather than trying to shoot it down. Previous How UK Museums Use Mobile Tech to Enhance Visitor Experience? Next How to build a start-up in a war zone?